Nestled in the Cowichan Valley, midway between between Victoria and Nanaimo on Vancouver Island, is Duncan, Canada’s smallest city by area, at just 0.8 square mile. But small doesn’t mean this area isn’t rich in opportunities for visitors. Dip Into Something Sweet. On February 2–3, enjoy a quintessential Canadian experience at the annual Bigleaf Maple Syrup Festival, held at the BC Forest Discovery Centre (Duncan, 2892 Drinkwater Road; 250.715.1113). Thanks to a profusion of big-leaf maple trees and reliable cold snaps, which make the trees’ sap run in sufficient quantities, this festival shows off this sweet treat with maple-tree-tapping demos, free maple tea, a syrup competition and tastings. The site is also home to an open-air museum that celebrates the area’s once robust timber industry; don’t miss the operational railway with train rides. Get Your Blood Flowing. It may be winter, but in this area—which has the warmest year-round temperatures in Canada—it’s easy to hike year-round. One modest hike begins in Koksilah River Provincial Park, about 17 miles south of Duncan. 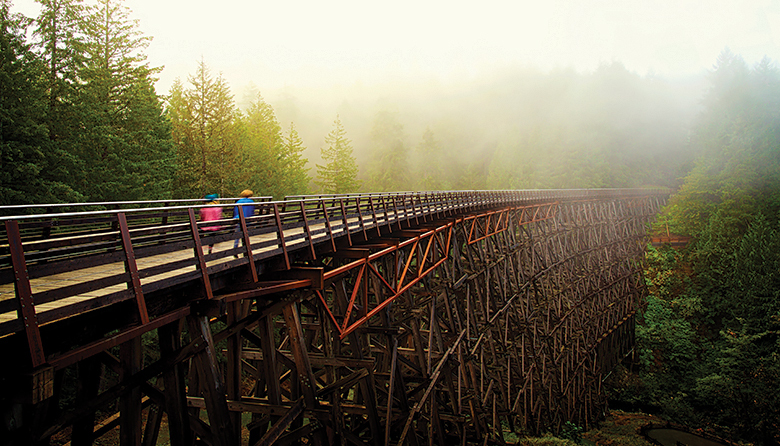 Hike just over 3 miles on the Jack Fleetwood Trail to the spectacular Kinsol Trestle (Shawnigan Lake, 2869 Glen Eagles Road; 250.746.2620), one of the tallest freestanding timber railway trestle structures in the world at 144 feet high. Visitors can also access it from the Kinsol Trestle parking lot (0.7 mile from the trestle). Seek respite after your hike at Merridale Cidery & Distillery (Cobble Hill, 1230 Merridale Road; 250.743.4293), where you can try cider-leavened bread and the house-made Cowichan line of spirits. View the Totem Poles. Take a self-guided walk to see the more than 40 totem poles located in downtown Duncan (pick up a tour map at the Duncan City Hall, 200 Craig St., or view the online tour). The town, which was designated “The City of Totems” in the late 1980s, boasts the largest collection of outdoor public totem poles in Canada. Browse and Eat. Afterward, stop by the Duncan Garage Café & Bakery (330 Duncan St.; 250.748.6223), a vegetarian eatery, bread store, bookstore and general marketplace; or visit The Old Firehouse Wine & Cocktail Bar (40 Ingram St.; 250.597.3473), where the focus is on fresh, seasonal ingredients. On Saturdays, those seasonal ingredients are on display at the year-round Duncan Farmers Market (10 a.m.‒2 p.m.; 200 Craig St.; 250.732.1723). Check In for the Night. Enjoy views of the bay from the OceanFront Suites at Cowichan Bay (Cowichan Bay, 1681 Cowichan Bay Road; 250.715.1000) near Duncan. Closer to town, the recently renovated 1904 Maple Bay Manor (Duncan, 437 Maple Bay Road; 236.594.6000) offers three suites overlooking Quamichan Lake. Before Heading Home. Cap your trip with a visit to Westholme Tea Farm (Duncan, 8350 Richards Trail; 250.748.3811), where you can sample teas from more than 800 rare, single-origin tea plants. British Columbia’s only tea farm began as an experiment, but it now draws visitors from across Canada for special steeps. Grab a cup to go as you head back home. Duncan, British Columbia, is roughly five hours north of Seattle via car and ferry. You can catch a ferry from Tsawwassen to Nanaimo, which is about 30 miles from Duncan, on Vancouver Island.